A recent evaluation of a VA pilot program in 10 VA medical centers highlights the significant contributions that middle managers can make in transforming their organization into a learning healthcare system. To date, little attention has been given to the role of middle managers in the implementation of Lean management principles as a means of creating learning healthcare organizations. empower staff to own Lean. One approach to transforming into a learning healthcare organization is through the implementation of Lean management systems (LMS), which incorporate methodical approaches into visualization-driven process improvement and standardization.1 This transformation goes beyond using tools and techniques to thinking of the organization as a socio-technical system—and recognizing the importance of the social system in influencing the behavior of organizational members. Lean scholars have noted that the basic approach to management and culture must change, yet the field knows little about what is required to achieve such transformation. What is well established is the importance of executive leadership support and frontline staff engagement. Even though middle managers play key roles as the bridge between senior leaders and frontline staff, relatively little attention has been given to their roles in implementation. How do middle managers provide employees with necessary information about innovation implementation? Middle managers in all sites utilized similar communication mechanisms (e.g., huddles, meetings) and styles (i.e., open and multidirectional) to implement Lean. However, in comparison to low implementation sites, middle managers in high-implementation sites exhibited a style that was non-punitive. How do middle managers synthesize information to provide relevant examples to help employees understand innovations? Middle managers in all sites personally participated in Lean improvement activities (e.g., Value Stream projects), sought to improve implementation of Lean and break down barriers to Lean by requesting staff input on process, and garnered staff involvement by soliciting staff input about Lean. In comparison to middle managers in low-implementation sites, those in high-implementation sites empowered frontline staff to take leadership roles in Lean, encouraging their peers to participate and share ideas via the huddling process. Additionally, they used data to identify areas for improvement and monitor goals. Middle managers in high-implementation sites also addressed staff barriers to data, including access to data and the ability to use data to reflect improvements. Further, middle managers in low-implementation sites talked in less specific terms about continuous improvement, often describing a "just fix it" mentality, and exhibited an initial resistance to Lean participation that was not present in high-implementation sites. How do middle managers mediate between strategy and day-to-day activities to give employees the tools needed to implement innovations? Middle managers in all sites faced challenges providing resources (e.g., time, staff) for Lean implementation and mentioned use of "trickle down" training, introducing Lean through everyday work. Several middle manager actions were unique to high-implementation sites, including middle managers that coached and mentored each other on how to best use Lean. Middle managers in high-implementation sites shifted resources to create coverage or protected time for staff involvement. These middle managers encouraged staff to attend formal Lean training, and coached staff to use their knowledge and skills. Middle managers in high-implementation sites also fostered independent thinking and staff ownership of Lean by having staff generate their own projects and run huddles. Conversely, middle managers in low-implementation sites were often unable to find resources or creative solutions to carve out protected time for staff involvement, contributing to decreased staff involvement in Lean overall. Although low-implementation sites offered Lean training, middle managers did not clearly convey permission or ability for frontline staff to attend such training. While middle managers in low-implementation sites allowed participation in Lean activities when staff showed interest and resources were available, there was less middle manager support and coaching. Finally, middle managers in low-implementation sites did not encourage staff ownership of Lean. How do middle managers encourage employees to consistently and effectively use innovations? Middle managers in all sites sold Lean by emphasizing its impact on care to Veterans, using Standard Work (Lean tool that provides structure to processes and roles), and providing recognition of staff participation and achievements in Lean. All middle managers faced challenges in selling Lean to frontline staff, including setting formal Lean expectations (e.g., performance reviews) and incentivizing use of Lean (e.g., awards). High-implementation site middle managers facilitated buy-in by providing feedback on the importance of the work, using early successes, and clarifying staff roles in Lean. Middle managers in high-implementation sites also discussed the need to identify meaningful rewards for Lean participation. Finally, high-implementation site middle managers sold Lean by providing verbal/morale support toward the goal of staff empowerment and ownership. In contrast, middle manager support in low-implementation sites was limited to providing information without the goal of empowerment and ownership. Contrary to other low-implementation sites, one outlier was able to use financial incentives (e.g., goal sharing) to recognize Lean staff achievements. Although there were similarities in the roles and actions of middle managers in the high- and low-implementation sites, distinct differences were found that may explain the greater extent of implementation. 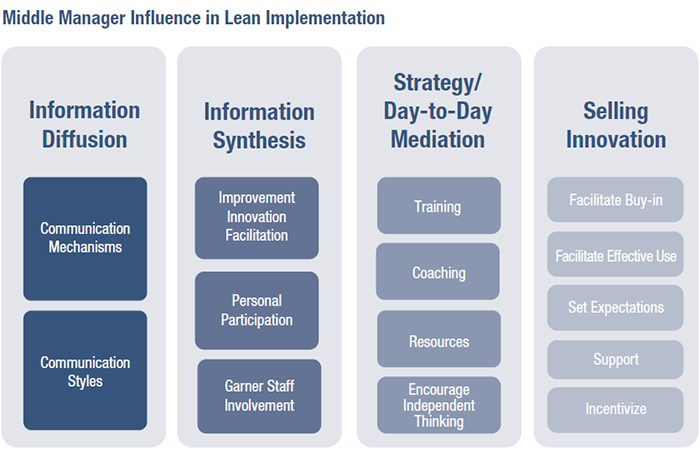 In response to these findings, there are some concrete actions middle managers can take to positively influence the uptake of Lean: 1) provide support after training, 2) encourage staff to participate, and 3) empower staff to own Lean. Recognizing these key middle manager actions may contribute to Lean implementation success. Armstrong S, Fox E, Chapman W. "To Meet Health Care's Triple Aim, Lean Management Must Be Applied Across the Value Stream," comment on "Management Practices and the Quality of Care in Cardiac Units," JAMA Internal Medicine 2013; 173(8):692-94. Lukas CV, Holmes SK, Cohen AB, et al. "Transformational Change in Health Care Systems: An Organizational Model," Health Care Management Review 2007; 32(4):309-20. Birken SA, Lee SY, Weiner BJ. "Uncovering Middle Managers' Role in Healthcare Innovation Implementation," Implementation Science 2012; 7:28.